The Nautilus U614 Upright Bike has a lot of good features. And all at a reasonably affordable price for a more than basic upright exercise bike. It comes with 20 magnetic resistance levels, belt drive, 22 programs, tracking for 2 people, water bottle holder and is adjustable to fit a range of people. It definitely looks like it has everything you need to get a good low impact workout in your home – there might no longer be the need to get out in the bad weather or making trips to the gym, which pay those monthly fees, to get your workouts and training. In my review I explain how well those features work to make effective workouts and exercise as well as go into who it will suit as well as look at who it might not be the right bike. To start with I take a look at how well it holds you steady while you workout. The well constructed frame and stabilizer bars help to keep the bike stable and sturdy while you workout at any intensity. When properly set up there shouldn’t be any creaks or squeaks from the bike to distract or annoy you. To keep the bike from rocking side to side when the floor is uneven there are levelers under the stabilizer bars that you can turn to balance up the bike. They do give you a good amount of play so should work on most level floors. The warranty for the bike is: Frame 10 years, mechanical parts 2 years, electronics 1 year and wear items and labor 6 months. This is better than many other exercise bikes in the price range. You can adjust the vertical position of the seat to accommodate a range of people between the heights of 4ft 10 ins and 6 ft . This range is based on customer reviews as unfortunately the Nautilus doesn’t like to provide this information. It does depend on leg length so if you are above or below these heights you may still be able to get a proper fit. Also if over the height you may get a comfortable fit but you might not have a full leg extension which can cause pain or even injury in your leg when using the bike for a long period of time. Making the adjustment to fit the bike to you is quick and easy to do. It takes a little more time the first time as you need to find the position that is right for you. If you are the only person using the bike you don’t have to adjust the bike again. If there is more than one of you then you simply return it to the setting that is best for you if the seat has been moved by using the adjustment knob and moving the seat and then fixing back into place. To make this easier you can mark your position on the pole with a marker pen rather than relying on memory. The seat doesn’t move horizontally, unlike the Nautilus U616 or Schwinn 170, so you may find if you are shorter that you have to lean forward more than you want to. Most do find that the position is fine for a good workout. The 20 levels of magnetic resistance is controlled through the console. You can manually adjust the resistance by pushing the up/down buttons or one of the quick jump buttons. The quick jump buttons allow you to jump to a certain level of resistance without having to press the up/down buttons to get there . You can jump to 10 levels – 1, 3, 5, 7, 9, 12, 14, 16, 18 and 20. When using one of the pre-set programs the resistance is changed automatically as you progress through the program. However, if you find the resistance is not what you want you can change it up or down to a level that is better for you. The movement between the levels is smooth without any large sudden jumps even when using the quick jump buttons. The levels do move up incrementally from very easy to very hard. The easiest level is very easy and is almost like there is no resistance at all – making it a good place to get started for some. The highest level is very hard and should challenge all but the toughest athletes. If the bike is not plugged in to a wall socket you can pedal but you can’t use the resistance – there is no other way to change it. You also won’t be able to use the pre set programs or see your progress. The magnetic resistance operates very quietly and is low maintenance as there is nothing touching the flywheel. As you get to higher levels of resistance you will probably find that the pedaling isn’t as smooth as the resistance has more of a braking effect – it means you need to concentrate more on your pedaling to stop it becoming more of an upward down stroke rather than a full circular motion – which can cause some impact. The bike has a belt drive and a weighted flywheel to provide a smooth and quiet operation. Unlike a chain drive there isn’t any requirements for ongoing maintenance. It is all covered up to help to keep out dirt and sweat to protect from damage and prolong its life. The covering also helps to protect children and pets from being hurt by the moving parts. The pedals have a standard size pushing and straps to keep your feet in position and stop them from slipping off. Initially the straps can be difficult to adjust due to plastic being hard but they soften up. If you’re not adjusting the straps for different people you can just slide your foot in without having to adjust. If you don’t like the strap you can take it off. The pedals are designed to be used with athletic shoes or similar. The pedals are attached to single piece crank which provides a good base for you pedaling and should be durable. If you want to change for other pedals the thread size won’t be standard, it is likely to be 1/2 in due to crank type. Due to the straight crank if you have size 10 feet or bigger you may find that you bang your ankles or heel of your shoe on the crank each time you pedal. This can be solved by adjusting your alignment of your foot or removing the strap and moving your foot further out or using a pedal extender. Both can feel awkward. If you have larger feet you may want to try the Nautilus U616 which has larger pedals and also better designed crank arms so you don’t have this problem. It is possible to stand on pedals but is not advised by company (by email). It is not tested nor designed for this as it is with a spin bike or indoor cycle, If this is what you want to do you can check my post on the best indoor cycles and spin bikes under $500 here. It is better for sitting and pedaling. You could stand on it for short periods of time, I think. It will be awkward. Extended period of times up out of the seat will likely shorten the length of life of the bike in particular the cranks and pedals. It is possible to pedal in reverse but there isn’t any resistance. Seat. Some people find this padded seat very comfortable so they can use the upright exercise bike for as long as they want without numbness or pain. But, as with any bike seat not everyone is impressed with it. Some people have described it as the worst seat they’ve ever sat on. It can cause numbness and pain in some users. For some this maybe due to them not being used to a bike seat and may just take a little time to break it in. But there are things that can be done to make it a more comfortable ride so you can workout for as long as you want without too much discomfort. They are a get seat cover and/or padded cycling shorts. It is also possible to change the seat as you can fit standard bike fitting seats that might be more to your liking to get the comfort needed. Handlebars. These are covered to provide a better and more secure grip. They are shaped so you can grab the ends and lean on them. They aren’t padded so you may end up with aching arms if you do it for too long. The angle of the handlebars can be changed to find the best position for you to use which can help with the lack of horizontal adjustment in the seat. Dirt and Dust. The bike itself doesn’t generate much of this. The biggest source of cleaning is likely to be sweat. Although the bike has been made to reduce the corrosive effects of sweat it is still important to keep the bike free of it by wiping it down after use. You may also want to put the bike on a rubber mat to stop the seat dripping on to the floor. Noise. It operates very quietly. It can be used time or night without disturbing others. It probably won’t even wake up a sleeping baby. If you want to watch TV you can do so without having to turn up the volume. It’s good for apartments as your neighbors will never know you are working out. As a precaution people put the bike on a rubber exercise mat so nothing can be transmitted through the floor. The bike needs an area of 21.6 by 41.8 ins for storing. It is reasonably compact so it won’t overpower a room but does make it too big for a cupboard – it is more likely to be stored in a corner, against a wall and below the stars. There are transport wheels on the front stabilizer bar. You tip the bike forward and downwards to engage the wheels. These wheels then hold most of the weight of the bike making it an easier job to move it around to where you want it. It is possible for one person to do this. The wheels have a good clearance and will work on most surfaces except for those that are very soft where the stabilizer bar will catch or a deep pile carpet where the wheels may jam up. You also need to be careful on wood floors as these wheels can scratch and dent the floor. The bike comes to you part completed with the hardest part done. It is easy to finish the assembly and usually takes between 1 and 2 hours to do it. If you have ever put together kitset furniture you should find this easier than that. The instructions and diagrams are easy to follow. The tools needed for the assembly are included – although if you have your own this will probably make it go much quicker. You are required to attach to the drive and frame the stabilizer bars, pedals, seat post, front post, seat, console, handlebars and bottle holder. One person can do the job but a second person will make it go easier. Having someone hold the pieces being attached is easier than trying to hold it and attach at the same time in particular when attaching the console and its wires. However, if you prefer you can use Amazon’s assembly service. It does cost extra but it seems to well regarded by customers. It does save you time and the hassle of doing it yourself. The console seems a little out of date but it is relatively easy to navigate round. You do need to download the instructions to make the most of pre-set programs from the supplier’s site as these aren’t included with the bike. The dual displays show different information to keep you informed of how you are getting on with your workout. The dual display is a good idea so you can still some measures when you put a tablet or Ipad on the media shelf with top display being covered up. The measures on both screens can be both easily seen (when you’re not using the shelf) from the seat when you have good light but are more difficult to see in poor light as they aren’t backlit. The upper display provides you with a graphical display of your progress and performance. On the left of the screen it has a column with a scale from 1 to 10 that shows the intensity of your workout based on resistance with the more intensity the more of the columns that is filled on. On the right side of the scale is a similar column that works when using the hand pulse sensors. It indicated your percentage of target heart rate you are working at – with the following zones: under 50%, 50 – 70%, 70% – 80%, 80% – 90% and 100%. Between these two columns and the upper part of the screen you get to see the program you are following. At the top is the name of the program. Below this is a graphical display to show the program. It has columns across the screen each standing for a time segments and the height of the column indicates the resistance for the segment. The segment that you are in flashes so you know where you are up to. Below this section is a display that shows how much you have of your goal left to complete and percentage of goal completed. It also lets you know whether it is time, calories or distance you’ve set as target. To the right side of this it lets you know which user profile is being used and whether you’ve achieved a goal or milestone with a star that lights up. The console also makes a celebration sound, which doesn’t sound like much but it can give you a boost of motivation at the time. There are also lights lower on the console that let you know the type of achievement and a goal tracking button to let you know what the achievement was. Underneath this display, below the shelf so it doesn’t get covered up when you place a media device on it, is the lower display. This display is split into 3 sections. The left section has speed, time or distance. The middle section shows distance, resistance level or RPM. The right section has calories or heart rate. You can choose the measures to be displayed in each of the sections through the user profile set up screen. You can set for a fixed display which you can then cycle through by manually pushing the arrow buttons or to scan through them every 6 seconds. At either side of the lower display are up/down buttons for changing the current resistance level whether using a manual program or pre-set profile program. Below the displays are the buttons used for controlling the programs. There are also 3 LED lights that come on when you achieve a milestone letting you know if it is current workout, last workout or in the last 7 days. At the bottom of console are the 2 speakers and in the middle is the fan. Above the fan is the button for controlling the fan. There are a good range of programs you can choose to use to keep you motivated and add variety to your workout sessions. Manual Program. – this is where you can get on the bike and not choose a program to follow along to. You just adjust the resistance to suit yourself. You don’t have the option to set a target for the workout. Profile Programs. There are nine of these and they automatically adjust the resistance for certain time segments. There are 3 categories of them, the names do give you an idea of what is in store for you – fun rides, mountains and challenges. The layout of the programs are shown in the manual. You can set a goal for time, distance or calories when you choose one of these programs. Fitness Test Program. This is a program that gives you an indication of your fitness progress with it doing a calculation based on your watts (power) and your heart rate. You need to be holding the hand pulse sensors – it starts with a warm up increasing intensity until your heart rate is about 75% and then holds the intensity steady for 3 minutes and gives you a score. Heart Rate Control Programs. These programs use your target heart rate based on your age to keep your heart rate within a selected zone by adjusting the resistance as you progress. You need to be gripping the hand pulse sensors to be able to use these programs. You have a choice of beginner and advanced and then you choose from 50 – 60 %, 60 – 70%, 70 – 80% and 80% – 90%. You can then select a target of calories, distance or time for the workout. At the end of the workout the bike starts a 3 minute countdown for a cool down period and it shows your workout results. The resistance is set automatically to a 1/3 rd of average workout resistance and this can be changed. You don’t have to record these manually when you want to track results and progress if you have a USB stick and a Nautilus Account you can upload and do this online. User Profiles. You set up 2 separate profiles and all workouts on the bike are added to one of the profiles. These help to give you better measures for calories and heart rate zone as well as record your results separately which is great for using with the Fitness Account. To set up your profile is straightforward through the console. You enter your name, gender, height, weight and age. You can also select what measures you want displayed on the lower display. You can’t set up a separate profile for guests, so if you’ve used both profiles anybody without a profile there workouts will be added to one of the user profiles. The power cord is about length which does restrict where you can put the bike unless you use an extension cord. It attaches at the bottom of the front support out of the way of pedaling. The cord may be a bit of a trip hazard depending on how you situate the bike especially as you probably won’t want it facing the wall as the position of the jack leads you to do. The console does beep when you use it and as you go through the programs by default. But this can be turned off in the set up menu if it’s too loud or annoying. The hand pulse sensors are in the cross bar part of the handlebars. You have to grip both of them to get a reading. While using a heart rate control program or just getting a heart reading they have to be gripped which does restrict you. Also, these type of sensors can be temperamental and unreliable. It doesn’t matter the bike they all have problems. Some people can get them to work but many do struggle no matter what they do. If you want to just monitor your heart rate you are better using a heart rate strap and monitor and do this independent of the bike console if you can’t get it to work. If you are looking to use the heart rate control it is worth checking out the Nautilus U616 which costs more with better features and more programs and works with heart rate strap that does need to be bought separately. You can choose to have speed and distance in kilometers instead of miles by selecting it in the console set up menu. Most of the accessories are included as part of the console. However, they are explained here and not as part of the console. USB Port. This can be used to charge devices and for uploading workout data on to a USB flash drive for uploading to your Nautlilus Connect fitness account. It can provide a slow charge but won’t charge up larger devices when being used but will stop them from being drained as you use them while you workout. Speakers. These have a reasonable sound quality and loudness. To adjust volume and to choose the track or program you want you still do this with the media device. You plug it into the console using the MP3 speaker cable that is included. Fan. It has 3 speeds and seems to blow a reasonable amount of air but it is best described as breeze. To keep a cooling breeze on you can change the direction of the air a little using the louver handle. Fitness Account. 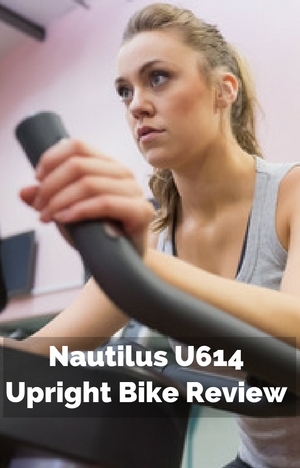 You can upload your workout results to the Nautilus connect A/c using a USB stick. You can connect it to your myfitnesspal.com. You can track and analyse your results and share them with others if you want. Water Bottle Holder. This isn’t part of the console. It is on the front support. It is in easy reach. You have to slide the bottle in and out to use so you may find you are slowing down as you lean slightly when you want a drink. If you want to watch your TV the console may get in the way depending on the height you have it at. T overcome this you can turn the bike slightly so you get a good line of sight to the TV. Customer reviews on the whole are positive with 80% of them rating this upright bike a 4 or 5. A few people have had a bad experience with the bike not working properly when they get it or something going wrong shortly afterwards. They then don’t like the way the issues are dealt with by the company treating them as servicemen to diagnose the problem. I can see that being annoying but it does seem the company do try to and often do sort the issues. If your shoe size is over 10 you may run into a problem with your ankles or heel banging on the crank arm depending on how you position your feet on the pedals (more an issue with Schwinn 130 which is a very similar bike and it is mentioned in a review for this bike too). As expected, like all exercise bikes, the seat is not universally liked with it ranging from the worse seat they’ve ever sat on to others who find it reasonably comfortable. The majority leave positive reviews, that say it is well made machine, it is easy and quiet to use and they can exercise and workout when they want to achieve their fitness goals and burn calories. The bike is similar to the Schwinn 130 (also supplied by the Nautilus) and is similarly priced. The U614 has much the same functionality but with a more solid build and easier to use console – it looks better too, . When I checked Amazon it qualified on orders that were eligible for Prime and free shipping. The Nautilus U614 Upright Bike is an upright exercise bike that can be used by both beginners and more advanced exercisers to get a low impact cardio workout that fits in with their ability and goals. It’s quiet, sturdy, reasonably compact and can be moved easily which makes it a good choice for a home. It’s not really for extended periods of time out of the saddle as you would with a spin bike or indoor cycle. It’s not for really tough demanding workouts as you do on those bikes but it can still provide hard workouts for many people in the saddle.